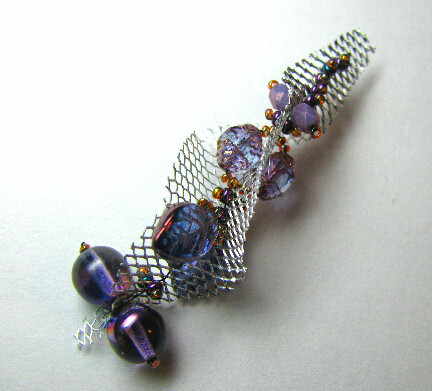 Beading Arts: Metal mesh earrings...not so much something I'd want to wear! 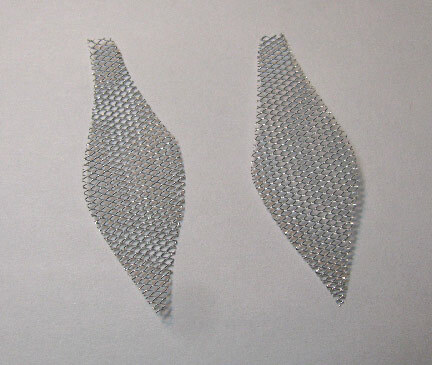 Metal mesh earrings...not so much something I'd want to wear! I know it doesn't look too terribly bad up there, and all it needs is an ear wire to finish it off, but for soooo many reasons, I have no intention of adding one! I never even made the mate. In fact, as soon as this posts, I'll be taking it apart. So what went wrong? It started with my choice of metal mesh. 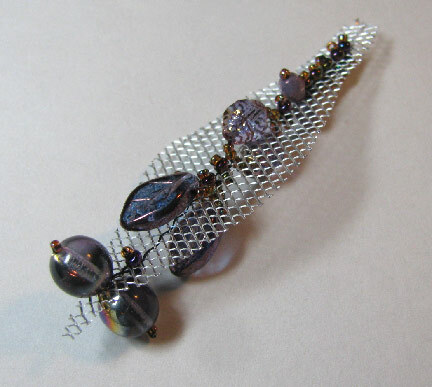 I used a very common wire mesh that is available through craft stores for modeling. It is meant to create an armature that you can cover with plaster cloth or polymer clay, or something similar. The edges are rough when it is cut into shapes, and I quickly decided that I really didn't want it hanging near my neck! The second issue is how rough the individual internal wires are. I am really afraid that after a short while, my thread would end up cut through. What I really wanted to do when all the beads were stitched on was to twist it as you see at the top. More strain on the thread, and now some of the little wires on the outsides broke their connections with their neighbors. Yay! Just what everyone wants...more sharp little wires swinging freely around their neck! Well...I think it was a good idea! And I think it looks cool too!!! Can't wait to see what you do with the other. I always love learning about different artist's creative processes and seeing how people think about their craft. I love that you shared a post like this about something that didn't quite work. Visually, the earring is beautiful, but it makes sense why it wouldn't be good to wear. I'm looking forward to your promise to re-visit the concept with different materials. Thank you...I think it's important for me to be able to admit that not every idea that comes into my head is a great one! Been there; done that. This is one thing I love about beading - you can always take a fail apart and re-use most of the parts.